Making mistakes online isn't cool. I recently attended a webinar that covered several aspects of Twitter and presented some interesting figures. Most impressive was that 31% of business aren’t even bothering with Twitter and they are missing out! The fact businesses aren’t even using Twitter isn’t the mistake I am referring too. The common mistake I am talking about is that many businesses seem to view Twitter only as a method to push their info (and could be part of the reason why so many businesses aren’t even using Twitter). Many social media managers refer to Twitter as the perfect network to “marry personal and business worlds”. Twitter is the social media network to be a personable, professional business person online. As a business professional on Twitter, there are three interactions to be part of: listening, speaking and responding. 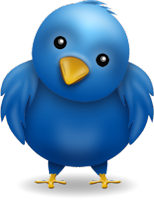 To learn more about using Twitter for your business, give me a call!